Red Desert rangeland in Wyoming. Water from melted snow pack can be seen on the ground. Such melting is the main source of surface water in Wyoming. Rangelands are distinguished from pasture lands because they grow primarily native vegetation, rather than plants established by humans. Rangelands are also managed principally with practices such as managed livestock grazing and prescribed fire rather than more intensive agricultural practices of seeding, irrigation, and the use of fertilizers. Grazing is an important use of rangelands but the term "rangeland" is not synonymous with "grazinglands". Livestock grazing can be used to manage rangelands by harvesting forage to produce livestock, changing plant composition or reducing fuel loads. Fire is also an important regulator of range vegetation, whether set by humans or resulting from lightning. Fires tend to reduce the abundance of woody plants and promote herbaceous plants including grasses, forbs, and grass-like plants. The suppression or reduction of periodic wildfires from desert shrublands, savannas, or woodlands frequently invites the dominance of trees and shrubs to the near exclusion of grasses and forbs. The United States Environmental Protection Agency defines rangeland as "lands on which the native vegetation (climax or natural potential plant community) is predominantly grasses, grass-like plants, forbs, or shrubs suitable for grazing or browsing use." The EPA classifies natural grassland and savannas as rangeland, and in some cases includes wetlands, deserts, tundra, and "certain forb and shrub communities." The primary difference between rangeland and pasture is management; rangelands tend to have natural vegetation along with a few introduced plant species, but all managed by grazing, while pastures have forage that is adapted for livestock and managed, by seeding, mowing, fertilization and irrigation. Prairies are considered part of the temperate grasslands, savannas and shrublands biome by ecologists, based on similar temperate climates, moderate rainfall, and grasses, herbs, and shrubs, rather than trees, as the dominant vegetation type. Temperate grassland regions include the Pampas of Argentina, and the steppes of Eurasia. Grasslands are areas where the vegetation is dominated by grasses (Poaceae) and other herbaceous (non-woody) plants (forbs). However, sedge (Cyperaceae) and rush (Juncaceae) families can also be found. Grasslands occur naturally on all continents except Antarctica. In temperate latitudes, such as northwest Europe and the Great Plains and California in North America, native grasslands are dominated by perennial bunch grass species, whereas in warmer climates annual species form a greater component of the vegetation. Steppe, in physical geography, refers to a biome region characterized by grassland plain without trees apart from those near rivers and lakes. The prairie (especially the shortgrass and mixed prairie) is an example of a steppe, though it is not usually called such. It may be semi-desert, or covered with grass or shrubs or both, depending on the season and latitude. The term is also used to denote the climate encountered in regions too dry to support a forest, but not dry enough to be a desert. Pampas are the fertile South American lowlands that include the Argentine provinces of Buenos Aires, La Pampa, Santa Fe, Entre Ríos and Córdoba, most of Uruguay, and the State of Rio Grande do Sul, in the southernmost end of Brazil covering more than 750,000 km2 (289,577 sq mi). These vast plains are only interrupted by the low Ventana and Tandil hills near Bahía Blanca and Tandil (Argentina), with a height of 1,300 m (4,265 ft) and 500 m (1,640 ft) respectively. The climate is mild, with precipitation of 600 mm (23.6 in) to 1,200 mm (47.2 in), more or less evenly distributed through the year, making the soils appropriate for agriculture. This area is also one of the distinct physiography provinces of the larger Paraná-Paraguay Plain division. 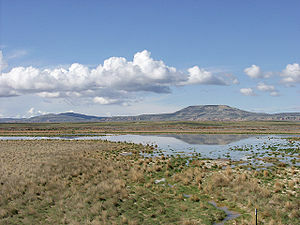 These plains contain unique wildlife because of the different terrains around it. Some of this wildlife includes the rhea, the badger, and the prairie chicken. Shrubland is a plant community characterized by vegetation dominated by shrubs, often also including grasses, herbs, and geophytes. Shrubland may either occur naturally or be the result of human activity. It may be the mature vegetation type in a particular region and remain stable over time, or a transitional community that occurs temporarily as the result of a disturbance, such as fire. A stable state may be maintained by regular natural disturbance such as fire or browsing. Shrubland may be unsuitable for human habitation because of the danger of fire. The term "shrubland" was first coined in 1903. Woodland is a low-density forest forming open habitats with plenty of sunlight and limited shade. Woodlands may support an understory of shrubs and herbaceous plants including grasses. Woodland may form a transition to shrubland under drier conditions or during early stages of primary or secondary succession. Higher densities and areas of trees, with largely closed canopy, provide extensive and nearly continuous shade are referred to as forest. Savanna is a grassland ecosystem characterized by the trees being sufficiently small or widely spaced so that the canopy does not close. The open canopy allows sufficient light to reach the ground to support an unbroken herbaceous layer consisting primarily of C4 grasses. Desert is a landscape or region that receives an extremely low amount of precipitation, defined as areas with an average annual precipitation of less than 250 millimetres (10 in) per year, or as areas where more water is lost by evapotranspiration than falls as precipitation. In the Köppen climate classification system, deserts are classed as BWh (hot desert) or BWk (temperate desert). In the Thornthwaite climate classification system, deserts would be classified as arid megathermal climates. Tundra is a biome where the tree growth is hindered by low temperatures and short growing seasons. The term tundra comes through Russian тундра from the Kildin Sami word tūndâr "uplands," "treeless mountain tract." There are three types of tundra: Arctic tundra, alpine tundra, and Antarctic tundra In tundra, the vegetation is composed of dwarf shrubs, sedges and grasses, mosses, and lichens. Scattered trees grow in some tundra. The ecotone (or ecological boundary region) between the tundra and the forest is known as the tree line or timberline. Rangeland is a prominent feature of rural Canada. A provincial jurisdiction, administration and policy regarding range use varies across the country. As in many other Commonwealth countries, public tenures on crown land for the purpose of range activities are common in geographically compatible areas. Reconciling the economic needs of ranchers and the need for environmental conservation is one of the primary themes in modern range discourse. In western Canada, both grassland and forested range are significant. In British Columbia, 70 percent of grassland range is privately owned and 60 percent of the total annual livestock forage requirement is provided by grazing on Crown rangeland (34 million hectares), 80 percent of which is forested range. Grassland range predominates in much of the prairie provinces’ ranching area; however, forested range is particularly important in the boreal region. Certain rangelands are preserved as provincially-protected areas similar to parks, others are managed as community resources. For example, in Alberta since 2003 there has been legislation allowing the creation of "Heritage Rangelands" within the parks system. As of 2012 there were 2 heritage rangelands and 6 proposed future heritage rangelands run by Alberta Parks. There are also 32 provincial grazing reserves located throughout Alberta administered as public lands by Alberta Sustainable Resource Development. The federal government has administered several "Community Pastures" in Western Canada that were reclaimed lands suffering erosion during the 1930s. In 2012, it was announced that this federal involvement would be phased out over a six-year period. Of the land within the United States borders, 36% is considered rangeland. The western side of the United States is 53% rangeland. Around 399 million acres (1,610,000 km²) of rangeland are privately owned. The Bureau of Land Management manages about 167 million acres (676,000 km²) of publicly owned rangeland, with the United States Forest Service managing approximately 95 million acres (380,000 km²) more. Ranchers may lease portions of this public rangeland and pay a fee based on the number and type of livestock and the period for which they are on the land. Historically much of the land in the western United States was used for grazing and much of some states still is. In many of those states, such as Arizona, an open-range law applies which requires a land owner to fence cattle out rather than in; thus cattle are theoretically allowed to roam free. In modern times open-range laws can conflict with urban development as occasional stray cows, bulls, or even herds wander into subdivisions or onto highways. The different types of rangeland come together to form about 70% (excluding Antarctica) of the Earth's surface. About 75% of Australia’s land mass is Rangeland. 53 of Australia's 85 bioregions have rangelands. In Western Australia, rangelands cover about 87% of the state’s 2.5 million square kilometres. Australian Rangelands support significant parts of the nation's economy, including Australia's valuable mining industry ($12 billion/yr), tourism ($2 billion/yr), pastoralism ($5.5 billion/yr – cattle $4.4 billion & sheep $1 billion). Australia's rangelands include a diverse group of relatively undisturbed ecosysterms such as; tropical savannas, woodlands, shrublands, grasslands and deserts. Rangelands in Australia cover low rainfall and variable climates which include; arid semi arid and seasonally high rainfall areas. Rangelands in South America are located in regions with climate ranging from arid to sub-humid. Annual precipitation in these areas ranges from approximately 150 to 1500 mm (6–60 inches). Within South America, rangelands cover about 33% of the total land area. South American rangelands include; grasslands, shrublands, savannas, and hot and cold deserts. Rangelands in South America exclude hyperarid deserts. Examples of the South American rangelands include the; Patagonian Steppe, the Monte, the Pampas, the "Lianos" or "Cerrado," the "Chaco" and the "Caatinga." The change in the intensity and location of tropical thunderstorms and other weather patterns is the driving force in the climates of southern South America. In Kenya, rangelands make up for 85% of the land surface area, and are largely inhabited by nomadic pastoralists who are largely dependent on livestock. This movement often brings along an incursion of different diseases with the common one being the rinderpest virus in the Kenyan wildlife population from the Somali ecosystem. In the past, rangelands in western China supported a pastoral economy and large wildlife populations. Now the rangelands have shrunk due to population growth, economic, government, and social factors. Rangeland types in China include; Semi-desert, Dry Alpine Grasslands, Alpine Dwarf Shrub, Wetland types. Rangelands produce a wide variety of goods and services desired by society, including livestock forage (Grazing), wildlife habitat, water, mineral resources, wood products, wildland recreation, open space and natural beauty. The geographic extent and many important resources of rangelands make their proper use and management vitally important to people everywhere. Buffalo grazing on rangeland in Crook County, Wyoming. ^ Micropaedia: The New Encyclopædia Britannica. 9 (15th ed.). 2010. ^ a b c "Pasture, Rangeland, and Grazing Operations". U.S. Environmental Protection Agency. Retrieved 12 September 2015. ^ Werner, Patricia A.; B. H. Walker; P. A Stott (1991). "Introduction". In Patricia A. Werner (ed.). Savanna Ecology and Management: Australian Perspectives and Intercontinental Comparisons. Oxford: Blackwell Publishing. ISBN 978-0-632-03199-3. ^ What is a desert? ^ "desert". Encyclopædia Britannica online. Retrieved 2008-02-09. ^ a b "The Tundra Biome". The World's Biomes. Retrieved 2006-03-05. ^ "Terrestrial Ecoregions: Antarctica". Wild World. National Geographic. Archived from the original on 2011-10-21. Retrieved 2009-11-02. ^ "Management & Land-use - Legislation & Regulations". Alberta Tourism Parks and Recreation. Retrieved 2013-06-30. ^ "Provincial Grazing Reserves". Alberta Ministry of Environment and Sustainable Resource Development. 27 October 2006. Archived from the original on 19 August 2013. Retrieved 22 July 2013. ^ "Community Pasture Program". Agriculture and Agri-Food Canada. 2013-06-21. Retrieved 2013-06-30. ^ a b "What is Range". Cnr.uidaho.edu. Archived from the original on 2011-07-18. Retrieved 2010-12-22. ^ "Arizona Rethinking Open Range Laws" article by Marc Lacey in The New York Times October 11, 2010. Retrieved October 13, 2010. ^ "Home Page | Global Rangelands Knowledge System". globalrangelands.org. Retrieved 2016-02-24. ^ "WELCOME TO RANGELANDS WEST | Global Rangelands Knowledge System". globalrangelands.org. Retrieved 2016-02-24. ^ "Wrangle". wrangle.org. Retrieved 2016-02-24.